We’ve just ended 2018 on a tremendous high note, and we wanted to share the good news. We experienced sales growth of 13.6%, bringing in $4.32 million in 2018. Our projection for the year had been just 6%. Thanks to our community, we’ve grown by leaps and bounds when the grocery business in general is contracting. We now have more than 3900 Owners who’ve invested in the store, more than double the number we had when we opened in March 2013. Co-op Owners are friends and neighbors in the community who believe in our mission and want to support the cooperative business model. We now serve more than 325 customers every day – and many of them live and work downtown. We also had a fabulous holiday season. Please review the applications linked below before completing the Lend a Hand selection survey. You can also review our charitable donation policy. Asterisks indicate organizations that have not previously benefited from Lend a Hand. To view prior years’ totals, click here. To give you time to review the applications, our survey will remain open through December 24th. Owners, it’s time to vote. Did you know that for our annual election to be valid, 10% of our Owners must cast a vote? So each year, as our co-op grows, we need more Owners to vote. We now have more than 3800 Owners, so this year’s magic number is 380. We have five excellent candidates willing to serve on our Board of Directors. Our board members are Owners, just like you, and they volunteer their time to ensure that our co-op is fiscally sound and operating in accordance with our mission and values. Click here to see each candidate’s photo and written statement about why they want to serve on our board. There are two ways to vote: electronic ballot or paper ballot. Electronic ballot: Instructions will be emailed later today to all Owners with a valid email address on record. Look for an email entitled, “Important: Login Info for Co-op Market Board Election.” It will be sent from noreply@directvote.net. Be sure to check your spam folder, too. If you didn’t receive the email and would like to vote online, please contact Kristin Summerlin, Marketing & Owner Services Manager. Paper ballot: If you’d rather vote by paper ballot, they’re available in the store and are being mailed via USPS to Owners with no email address on file. If you receive a paper ballot in the mail, you can bring it to the store the next time you shop, or drop it in the mail. Remember: Each Owner number gets only one vote, so if you share a number with other members of your household, please consult with them before voting. Click here for more information about the election and our Board of Directors. Our election ends and results are announced at our annual meeting on Saturday, October 20th, at JP Jones Community Center. Doors open at 3 p.m.
Are You Ready to Save? 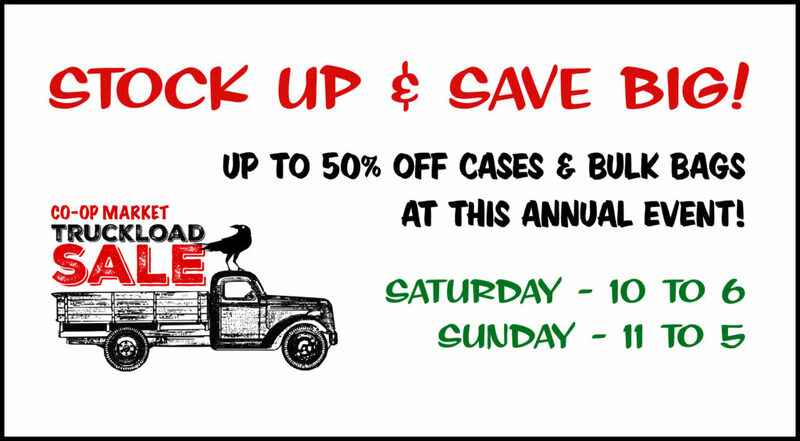 Truckload Sale This Weekend! It’s time for our 4th Annual Truckload Sale! Time to stock up and save up to 50% off when you buy by the case! Sale hours are 10 a.m. to 6 p.m. Saturday, May 19th, and 11 a.m. to 5 p.m. Sunday, May 20th. We’ll be offering cases and bags of shelf-stable pantry stockers at significant discounts. Look for great deals on dozens of items, including sustainably caught canned tuna and salmon; organic grains, beans, dried fruits and nuts; coconut and olive oil – and much more. The list of items and pricing is available here. We’re hoping to make this year’s sale a little easier to shop, so please look for the table marked “Start Here” for instructions and a tally sheet. We’d like for you to shop with the tally sheet in hand, marking down the quantity of items you want. We’ll load your purchases up while you do your regular grocery shopping and pay inside. This should save time for everyone. We’re celebrating our 5th birthday, so please join us for a free hot dog or veggie dog from 2 to 5 p.m. Saturday and free cupcakes and ice cream from 1 to 4 p.m. Sunday. Please note that all sales are good while supplies last. If there’s something on the list that you really want, please be sure to get here early. Many items sell out quickly, and we cannot offer rainchecks. Come to the co-op and meet Maya Wilson, Alaska food columnist and author of “The Alaska from Scratch Cookbook.” Maya will sign copies of her new book from 1 to 4 p.m. Saturday, May 12. This is her only Fairbanks event, so mark your calendars. It’s also Mother’s Day weekend and the perfect opportunity to get a lovely Alaskan gift for somebody special. In 2011 Maya moved from California to Alaska and launched the food blog Alaska from Scratch — a website dedicated to beautiful, approachable recipes for home cooks, along with frequent glimpses of Alaska’s unrivaled scenery and unique lifestyle. Since then, her site has grown to be Alaska’s premier food blog, reaching a global audience in the millions each year. Maya is also a chef and food columnist for the Anchorage Daily News and lives on the Kenai Peninsula with her family. The Alaska from Scratch Cookbook is so much more than a collection of delicious recipes with gorgeous photos. This is a cookbook well worth reading and savoring, whether you ever intend to cook the dishes or not. Cookbooks are available for purchase at the co-op. If you’ve already picked one up, be sure to bring it back on Saturday to have it signed. Click here for more information about Maya and Alaska from Scratch. You Asked, We Listened: Bread & Cheese! The results of our Shopper Survey were clear: You wanted a bigger, better, more affordable selection of breads. Cheese, too. We heard you! We’ve added so much more bread – including lots of gluten free choices – that we had to add standalone shelves to hold it all. Here’s a list of what’s new. Shopper Survey Results Are In! Our Shopper Survey results are in! Thank you to all who took the time to answer our questions. Your feedback will guide management, staff and our board of directors in our day-to-day work and as we plan for the future. What did we learn? Perhaps the most important takeaway is how deeply you care about your co-op. In total, 463 people started the survey, and 89% completed it. (Because of its length – 40 questions – Survey Monkey had projected a completion rate of just 53 percent.) Most people will drop out if a survey takes more than 5-10 minutes, so we were impressed that you spent an average of 18 minutes on ours. And you didn’t just tick off the boxes. You took the time to include approximately 600 comments: praise, constructive criticism, suggestions and questions. We’ll be studying these in depth to glean more insight into how we can better meet your needs. Click here for a preliminary survey report, including charts and graphs. Here are a few key findings. • Cooperation Matters – Three quarters of our respondents said the fact that we’re a co-op influences their decision to shop with us. 66% of our survey takers are Owners, and of those, 43% are long-time Owners (since the beginning or when the store opened in 2013). The top three reasons Owners cited for investing in the store are 1) to support local farmers and producers, 2) to support the local economy, and 3) belief in the co-op’s mission and values. 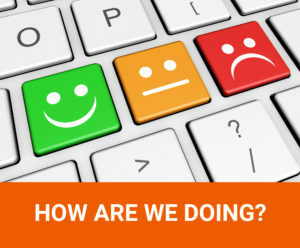 • Store Satisfaction Is High – Results show that 98% of respondents are satisfied with the store overall, with 59% “extremely satisfied.” And 98% would recommend us to friends and colleagues, with 82% “highly likely” to recommend. Our shoppers are happiest with our Bulk Foods, Produce and Wellness departments, and would like to see improvement in our Bread & Baked Goods, Deli, Cheese and Meat departments. • Why Shop the Co-op? – The top three reasons for shopping at the co-op are 1) to support local growers and producers, 2) to support good health and nutrition, and 3) to buy high quality organic foods. This is consistent with our mission and values of supporting good health by providing natural foods & products and promoting sustainability by supporting our local farmers & producers. • Pricing Concerns – While 75% find our prices to be either excellent or satisfactory, 15% rated them poor. We definitely need to do a better job of communicating about our many discount programs, including Co+op Basics, Co+op Deals and Owner Deals. We were surprised to see large percentages of respondents said they don’t know about (or don’t use) these benefits. Our buyers have already begun working on several pricing strategies, including regular comparison shopping. We will continue to work hard to provide the highest quality food at the best possible prices, while also balancing the needs of the store (paying our bills, creating a great work environment with decent wages, offering services to our Owners and the community, and becoming profitable). • We’re Not a One-Stop Shop (Yet) – 75% of respondents said they buy 25% or less of their groceries from the co-op, while only 3% said they buy almost everything here. We recognize that we are a small store and cannot carry every possible product choice, but we’ll be digging into your comments to find out what you always purchase elsewhere and why. If we can bring in new products or improve the quality of what we can, we will continue to do that. Again, thank you to everyone who offered your feedback and suggestions. We are inspired by you! Congratulations to the three survey takers who each won $100 in Co-op Cash: Paula Kunkel, Julianne Warren and Molly Lemen!